Please enjoy the following reflection from Dr. Ryan Fox, Assistant Professor of Math and Education. Also, don’t forget the deadline for full-time faculty to submit a Teaching Center travel grant application for upcoming teaching-related conferences and workshops is 4:00pm on September 11. This spring, the Teaching Center funded my travel to the Research Council on Mathematics Learning in Baton Rouge, Louisiana. Taking advantage of the conference’s location, the theme of this year’s conference was Let the Good Times Roll in Mathematics Learning. At the conference, I was fortunate enough to make two presentations. In each presentation, I connected two key components of the expectations of our research agenda at Belmont: producing in the Scholarship of Teaching and Learning and incorporating undergraduates into our work. My first presentation was a poster in conjunction with one of my advisees, Cearra “CC” Logan (Fox & Logan, 2018). In that presentation, we discussed how I connected mathematical games to mathematical activities I had done off-campus, working with new school teachers. In Table 1, I present a task and a game as focal parts of our presentation. Start with 7 pennies, all tails up. One turn is defined to be as flipping 3 pennies: either from heads to tails or from tails to heads. (Not all pennies have to be flipped the same way! One turn could be one head to tails and two tails to heads, for example.) What’s the fewest number of turns (flips of three pennies at a time) needed to turn all tails to all heads? Place 20 pennies on the table. The first player takes one, two, or three pennies per turn. The second player choose to take one, two, or three pennies per turn. Turns alternate until the 20th penny. The player to take the 20th penny legally on his/her turn wins the game! Table 1. Activities shared with future and novice teachers (Fox & Logan, 2018). In the task described in Table 1, I had to find the appropriate balance: how could I encourage CC to find the pattern in the answer to my questions without giving away information that directly led the answer to the question. Re-framing the same dilemma another way: how could I question without telling my student the key idea and concept of the material? Furthermore, an interesting challenge opens up if I change either of the numbers seen in the task. By changing the numbers, patterns emerge. How could I, as a teacher of teachers, encourage my student, an aspiring teacher at the time, to look? I think that is a question that cuts across many of our lectures and presentations as instructors. We are aware that the students-as-passive-receivers-of-information model is not ideal, yet we cannot leave our students to fly blindly without understanding something of the topic we have devoted some measure of our academic lives vigorously pursuing. In the game in the right column of Table 1, I could show one game could offer so many variations. Each variation offers me, as a teacher and a teacher of teachers, a slight variation on one mathematical concept. In the original form of the game, as presented in Table 1, the strategy to win the game is defensive in nature. However, changing any of the rules listed in Table 1, except the second one, changes the nature of the winning strategy, if only slightly. The strategy for winning involves mathematical concepts that I could explain to from fourth-grade students to an opening activity for a Pre-Calculus Mathematics course here. My second presentation was a collaboration I had with Dr. Shawn Broderick at Weber State University (Broderick, Weyburn, & Fox, 2018). 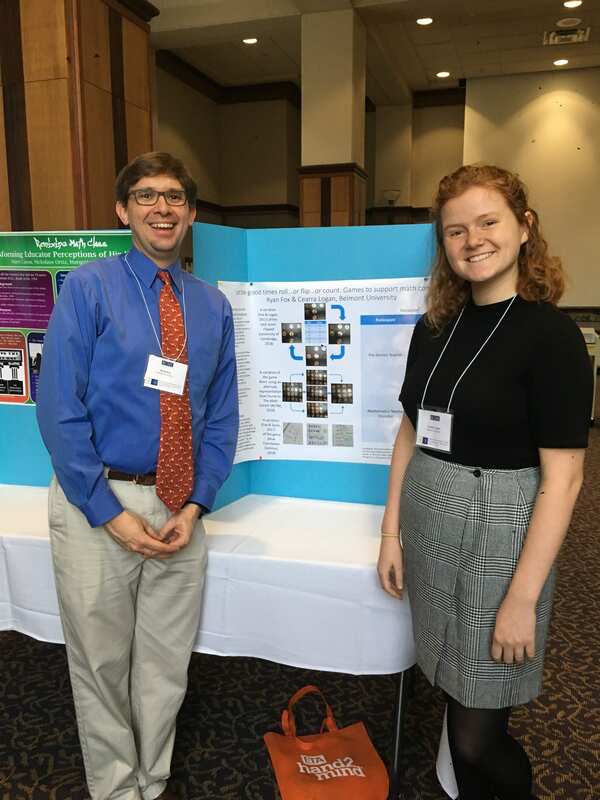 Dr. Broderick and his undergraduate researchers investigated how future elementary school teachers understand how to multiply and divide two fractions. In mathematics education literature, researchers have delineated a distinction between procedural understanding and conceptual understanding. Although an adult can perform the two operations–albeit with the help of a mnemonic device or two–teachers have to develop a deeper understanding of what the operations mean. In these cases, future teachers have to confront and challenge commonly-held misconceptions of the topic (multiplication makes bigger, division makes smaller) while representing the work in a meaningful way to others (connecting concepts from whole numbers to fractions, picturing the work and the answer that matches the given mathematical operation) and connecting to more advanced topics in the content (dilational transformations and rates of change). Working with future teachers at Belmont, I get the chance to ask the same questions in this study to encourage a deeper exploration of a topic my students have not seen in a long time. I enjoyed thinking about my teaching as a researcher, and developing stronger pedagogical practices firmly grounded in established literature in my field. The other fascinating component to this project and presentation is to work with undergraduates in a field where they are often participants in a research study, not necessarily equals as researchers. There are some interesting challenges that arise in this field when incorporating undergraduates into research in this field. Cultivating an appreciation and understanding of those for a population known to be apprehensive of mathematics is challenging enough, working with a few students to research that a few semesters removed from the very same coursework adds a fascinating level of complexity. How can undergraduates see the value of presenting two versions of fraction division with limited experiences working with students or background in higher-level mathematics? I was very excited to tag along to the beginning of their work and to share their results and continue their work in later projects! I am grateful to the Teaching Center and the funding opportunity they provided me to attend and present at this conference. The conference was a wonderful opportunity to present where I had worked on two key components of my research agenda. At the conference, I received wonderful feedback on how to think about making these presentations in publications. In the coming weeks and months, I hope to follow through with the presentations and feedback to produce exciting publications in teaching teachers about mathematics!